London-based Comics fans have a treat in store if they head over to Orbital Comics at Great Newport Street (WC2) from tomorrow until February 14th. 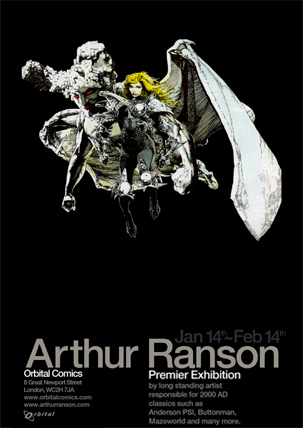 Orbital is hosting the first ever exhibition of artwork of the great Arthur Ranson, a name well-known to fans of seminal British SF comic 2000AD, where he has been a mainstay since 1989. In that august title, Ranson (Now 71 years of age) has been responsible for a terrific run of stories on Judge Dredd spin-off Psi-Judge Anderson – writer Alan Grant labelled him “the perfect Anderson artist” – and the excellent, ultra-violent Button Man with John Wagner. For the American market, Ranson contrinuted a great story for DC’s Legends of The Dark Knight series, “Tao“, and also a one-shot teaming Batman with The Phantom Stranger, also with Alan Grant and both hugely atmospheric works. More recently, he has done some work on Marvel’s X-Men series. Like many others, I discovered Ranson’s exquiste and mesmerising fine-lined work in 2000AD – specifically, the Judge Anderson tale Shamballa – and it made a deep impression on me, so it’ll definitely be worth checking this out…! Just found your site.It would seem churlish to just pass by,so thank you for the few kind words.